Scattered large farms and halls, some with origins in the early post-medieval period, in landscape of large and often long sinuous fields bounded by drainage dykes and hedges bordering the Clwyd, with some small areas of parkland to the south. 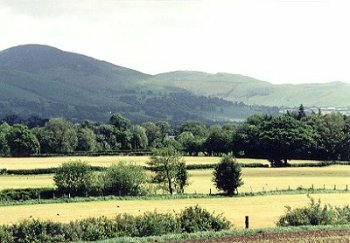 The character area falls along the boundary between the medieval ecclesiastical parishes of Llanynys, Llandyrnog and the small parish of Llanychan. In administrative terms it fell along the boundary between the western commote of Colion and the eastern commote of Dogfeilyn, both within the ancient cantref of Dyffryn Clwyd. The area is likely to have been seasonally waterlogged before it was drained, perhaps during the 16th century onwards and it is unsurprising that the earliest certain archaeology of the area is represented by its early post-medieval buildings. Flat, low-lying land on valley floor between about 35-60m above OD between the confluence of the Clwyd and the Clywedog. The land is subject to subject to waterlogging and would have been of more limited seasonal use before drainage was undertaken. Settlement is characterised by a number of large, widely spaced halls together with a number of scattered 18th- and 19th-century stone or brick smaller farms and cottages. Some of the larger farmhouses began life as 16th to early 17th half-timbered halls, which were remodelled or replaced during the 18th and 19th centuries. Both Plâs-yn-rhôs and Glan Clwyd were late 16th to early 17th-century half-timbered halls, rebuilt with outer stone walls during the course of the 18th century, Rhydonen being a 17th-century half-timbered house extended in brick and stone during the 18th century. Other farmhouses, such as Plas-yr-esgob, are 18th-century stone farmhouses, which like a number of others in the area are painted white. The late 19th-century brick and half-timbered farmhouse at Plas Llanychan, replaced an earlier probably early post-medieval half-timbered hall. Outbuildings associated with the farms are occasionally timber-framed, infilled with brick, but are otherwise of stone or brick, sometimes with a stone-walled stockyard. It is the later larger houses with attached home farms that tend to be set in the cluster of parkland towards the southern part of the character area, including the recently renamed Plas y Dyffryn (formerly Claremont and Clwyd Hall School), a late 19th-century brick villa with stone dressings at the recently with brick lodge, lodge gates, stables and walled gardens, and Plas Gwyn a late 19th/early 20th-century rendered villa. Smaller 18th and 19th-century houses are often rendered, as at Glanynys and Tyddyn-isaf. Relatively recent nucleated settlement at Rhewl established on the turnpike road between Denbigh and Ruthin and the two bridges - Pont Rhyd-y-cilgwyn and Pont Rhyd-y-gwaed - crossing the Afon Clywedog, comprising an inn, several limestone houses and chapel, and timber mission church of 19th-century date, with 20th-century school and housing. Large and occasionally long and sinuous fields, sometimes bordered by drainage ditches with their long axes parallel with the direction of drainage, and sometimes subdivided by post and wire fences. Predominantly pasture, with fodder crops on better drained land. Boundaries laid out with hawthorn hedges with occasional elder and other species and with scattered taller poplar, ash and alder trees, particularly along embanked stream and river courses and large mature oaks in some fields. Some recent hedge planting. Occasional stone field gateposts along public roads. Roadside stone walls of limestone blocks at entrance to Plas y Dyffryn, and stone and brick roadside walls at Plas Gwyn. The form of the landscape and associated houses suggests that the landscape essentially derives from 16th- and early 17th-century drainage and enclosure of former poorly-drained common meadow land alongside the river Clwyd. The public roads in the area are mostly minor, winding lanes. Even on the flat land the lanes tend to run in hollow-ways between 0.5-1.0m deep, suggesting that communication must have been difficult during certain seasons before the advent of modern stone surfacing and road drains. The area includes a number of minor but important bridges crossing the river Clwyd which are likely to have in some instances replaced medieval or early post-medieval fords or timber bridges, important in maintaining communication between communities on the eastern and western sides of the vale. The present stone bridges such as Pont Perfa, and Llanychan Bridge are of 18th/early 19th-century, with single or double-arched, coursed stone parapets with stone copings, some with cutwaters, and with secondary flood bridges in some cases. Pont Clwyd, a single-arched bridge between Llandynog and Llanynys, is unusual in having parapets made of large upright slabs, without copings. Occasional farm bridges giving access to land on the eastern side of the Clywedog from farms on the west. The course of the former Corwen to Rhyl railway built in the 1850s cuts distinctly across the western side of the area, still represented by straightened field boundaries, bridge abutments, gate-keepers cottage and modern lanes reusing the course of the former tracks. Small but important areas of parkland survive in a cluster at the southern end of the character area, comprising Plas y Dyffryn with mature, scattered oak, poplar and pine, the wooded garden around the late 18th-century former rectory, and the parkland and land of parkland character encircling Plas Gwyn and Plas Gwyn farm, subdivided partly by hedges, post and wire fencing, and a tree-lined stream, with scattered oaks and poplars.